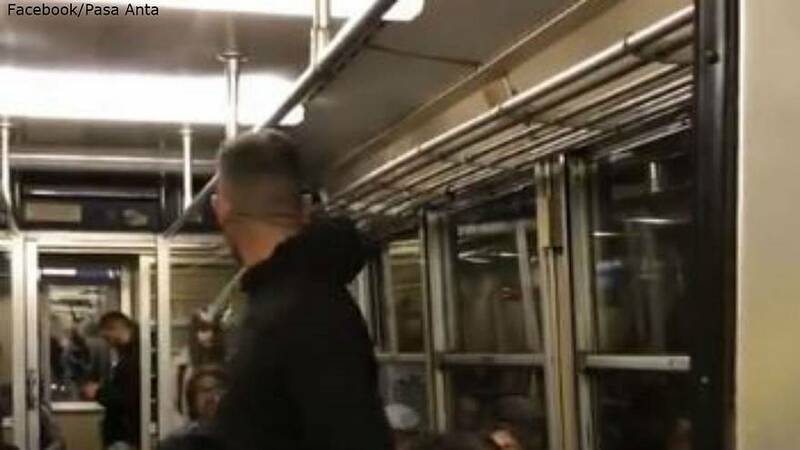 A video of a woman standing up to one man’s barrage of anti-immigrant comments on a train in Naples has gone viral in Italy. Pasa Anta had just entered the Circumvesuviana train — a local train that connects the city to small towns — when he saw a man shouting in the car. “At first it seemed like a ridiculous scene - almost a caricature of the ordinary man who utters clichés, stereotypes, and clichés of the extreme right,” Anta told Euronews via Facebook messenger about the scene he witnessed on Friday. A young man dressed in black can be seen in the video standing in the car and arguing with a woman who is sitting down. According to Anta, the woman had had enough of the young man targeting a group of commuters and intervened. In the video, you can hear her calling the young man a "fool, racist, and aggressive" and tells him he should be ashamed of himself. He responds "Italy is not theirs, it is ours!" "I reproached him that in a country populated by people like him, I would not want to live and would rather go away, the foreign young man was dressed in work clothes and seemed honest," she told Italian media. "We need a little more attention because rudeness and oppression are gaining power compared to decent people." The video has been viewed over 1.2 million times since it was posted to Facebook on Friday evening. Anta told Euronews that he stopped filming when the conversation escalated and moved closer to the woman so that he could intervene if something were to happen.